From the creative mind of Thomas Riboulet, creator of Sherlock'oin and also the Pinkie Work. Imagine that you could reveal a card that has been simply peeked at while your back was turned and your eyes were closed. Imagine that you never look at the face of the cards, or ask any questions... Imagine that you have the possibility to reveal this thought-of card in such a way that it would seem like real mind reading or telepathy. This card effect could become a powerful and emotional piece of mentalism. Imagine an effect that is super easy to perform with a normal deck. Do not imagine anymore... This is Dark Connection. The performer shows a deck of cards, turns around, puts on a blindfold, and asks a spectator to cut a few cards from the deck. The spectator shuffles the cards and when he wants, looks at the first card of the pile. Then, the spectator is requested to take a larger packet of cards, and cut this pack as he wants, to lose the card he saw amongst the others. 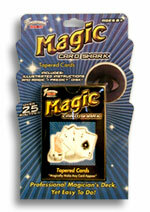 The rest of the deck is placed above the cards inside the spectator's hand. Once the performer is facing the spectator again, he explains that he will take the cards the spectator is holding and show them to him one by one. During this sequence, the spectator is asked to look at every single card the same way. But when he sees his card, he has to say STOP in his mind. Note: in his mind ONLY! Without ever looking at the face of any card, and without saying a word, and always with the blindfold on his eyes, the performer slowly shows each card. Magically, or by telepathy, the magician finds the card that the spectator chose and is thinking of at that exact moment! Dark Connection - No need to imagine anymore - this is real and will astonish your audience!